March 28th, 2016, Charlottetown – P.E.I.’s short track speed skaters made the most of home ice at the Canada East Short Track Championships presented by Irving Oil which were held over the weekend at the Eastlink Centre in Charlottetown. Andrew Binns had P.E.I.’s top finishes at the Canada East Short Track Championships held in Charlottetown over the weekend. Binns grabbed 4th place finishes in a pair of distances and 5th place overall in his age group. Photo courtesy of Kristen Binns. Andrew Binns led the way for the Island contingent, posting 4th place finishes in both his 200 metre sprint and 2000 metre points races. Binns also improved on his own provincial record times in the 200m and 400m distances for 12 year-old boys, enroute to 5th place overall in his age group. 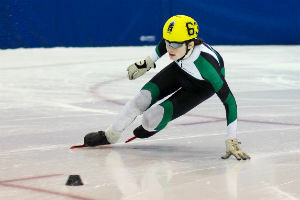 The finishes were the best to date for an Island skater competing at Canada East, which brings the best 11-15 year old skaters from Ontario, Quebec, the Atlantic provinces and Nunavut together to close the speed skating season. Stratford’s Mia Stewart broke Miriam Burnett’s three year old P.E.I. record for 12 year-old girls in the 200m distance and set another pair of PBs in her other timed events, finishing 15th among 12 year-old girls. Kyle Connell and Kristen Binns posted top 10 overall finishes in the 13 year-old boys and 14 year-old girls categories, respectively. Connell wrapped up his strong season with new PBs in his 200m and 400m sprint events, along with an exciting win in the B final of the 2000m points race, to secure 9th in his age group. Binns had her best finish and set a new PB in the 400m distance, where she finished 8th to help secure the top 10 overall placement. Jenna Larter of North Wiltshire grabbed a strong seventh place finish in the 200m sprint, after shaving more than a second off her PB time in the two lap race to finish ahead of a trio of Quebec and Ontario skaters in the distance, helping her take 11th overall in her age category. Meanwhile, Matt Kozma of Charlottetown, also making his second appearance in the Canada East event, grabbed PBs in his 200m and 400m distances, while posting a top ten finish in the 1500m event for 14 year-old boys. Thomas McQuaid posted a significant PB in the 1500m distance as well as in the 200m sprint, plus a top ten finish in the 400m event. McQuaid also teamed with Andrew Binns and Kyle Connell in the 3000m relay for 12/13 year-old boys, where the Island trio skated a pair of clean races to take fifth spot among ten teams, finishing ahead of a pair of Ontario teams. Matthew McKenna, Daniel MacKinnon, Carter Bruce and Simon Hale, each making their rookie appearances in Canada East, nabbed multiple PBs to mark a very successful weekend. Bruce took nearly two seconds off his previous best 400m time, along with a PB in the 200m event to cap a fine season. Hale, from Charlottetown, was one of just two Islanders to grab PBs in all three of his timed distances, while McKenna and MacKinnon each had a pair of PBs. MacKinnon, from Murray River, notched his biggest PB in the 1500m while McKenna made his biggest improvement in the 400m race. Quebec skaters dominated the overall competition, winning 100 of the 108 medals up for grabs, while Team Ontario won seven medals and New Brunswick one. For full results and information, visit www.speedskatepei.ca.